This topic contains 12 replies, has 6 voices, and was last updated by Thomaston 6 months, 2 weeks ago. Recently, I bought a Star Wars Legion AT-ST and took a while to paint it, as the flat panels were daunting… But I finished it off recently, there’s a few more pictures on my blog (and an AT-RT). Very nice, I’m a sucker for weathering, especially around the feet. Excellent work as always – also loving the weathering – the panels at the rear are particularly effective – nice and grimy – I was surprised to hear that they were easy to position, though – the walkers always look so top heavy, I would imagine it would be really fiddly to get the model to balance on the legs…..? Thank you, I meant that gluing the legs in their positions was quite easy. It is an overbalanced model, but I used two large dollops of Vallejo’s earth mix stuff under both feet. Then I balanced it against a spray can whilst the earth mix dried. The bond is strong enough to hold the walker in place once dry. It looks so dynamic. A credit it to you. It looks fantastic. Great job! Cheers guys, I’m glad you like it as much as I do! I don’t game sci-fi but I find “walkers” are very attractive. Probably something to do with my liking of WW1 & WW2 tanks. BTW they’d be a totally impractical piece of kit in the real world or am I missing something? 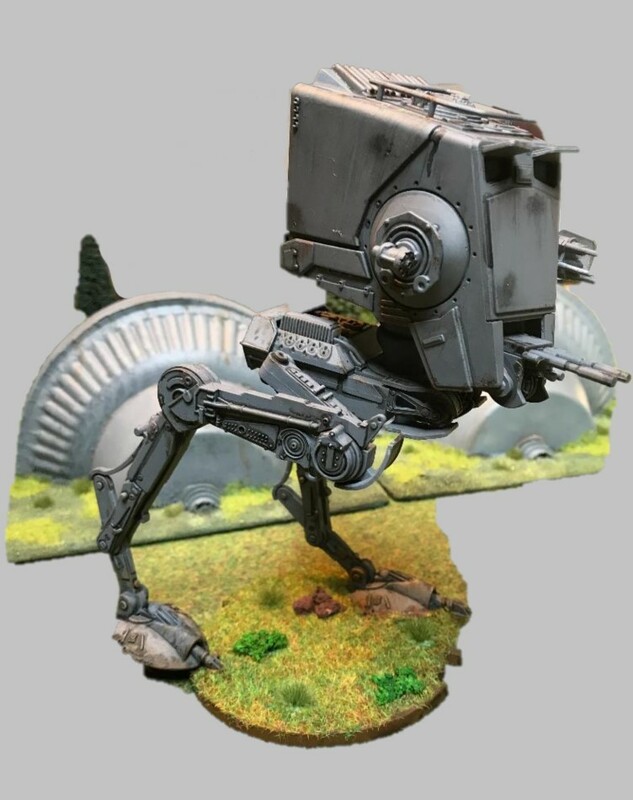 The AT-ST is top heavy, so yes, pretty impractical, but robots with two legs are coming on in leaps and bounds (pun intended), so who knows in the distant future? I think it’s the familiarity of legs and maybe lots of moving parts attract attention. Maybe it’s our caveman brain saying look, food.